Egypt’s 80 million people live and work on only a small fraction (4%) of the country’s land area. All of this area is concentrated along the Nile River. The Nile is essential to their survival as it enables a large rural population to produce a significant amount of food as well as high-value exports and to contribute 15% of GDP. It also provides the water needed for industrial and residential uses. Egypt’s agricultural resource base is under tremendous pressure from urbanization, population growth, and economic expansion in industry, tourism and other sectors. Salinization and desertification degrade a significant amount of agricultural land each year. Land access is a significant issue, particularly in Upper Egypt. Agricultural land per capita is low, and rural landlessness is high, due partly to a 1992 law (Law No. 96) that stripped about 1 million registered tenant families of permanent and heritable land rights. This law removed rental ceilings and reinstated landlords’ eviction rights for the first time in decades. Egypt’s recent reforms to its land-registration system have clarified land rights and facilitated land market development for many Egyptians; prior to these reforms (as recently as 2006) only about 10% of real property in Egypt was registered. Women have the legal ability to own and inherit land, but the legal framework and social custom discriminate against women, resulting in low levels of women’s land ownership. Rules on government allocation of newly reclaimed land discriminate against women. The Government of Egypt (GOE) plays a critical role in managing the Nile-based water supply for both agricultural and non- agricultural uses by: regulating the conversion of agricultural land to urban uses; developing new lands in upper Egypt and the Sinai to reduce pressures on both urban and agricultural resources; and preserving the substantial areas of historical interest along the Nile that support the tourist industry. Most water in Egypt goes at no cost to agricultural use, and Egypt’s water use is considered low by regional standards. Egypt’s participation in the regional Nile Basin Initiative (NBI) will make it incumbent upon the GOE to continue to reassess its objectives regarding the use of this crucial resource. Many observers have identified ways in which state governance of highly constrained land and water resources could be improved. Rights of women and tribal groups are often not recognized and/or respected by national or local authorities. Several government reforms, such as Law No. 96, have been implemented in a heavy-handed way, creating widespread difficulties for millions of Egyptians. Water distribution and management systems have been partially and ineffectively decentralized; much water could be conserved through improved irrigation management and a focus on water efficiency in crop selection and agricultural production techniques. Many external investors and donors continue to support Egypt’s efforts to make optimal use of its land and water resources. The Government is actively reclaiming desert land for both agricultural purposes and more dispersed urban development in both upper Egypt and the Sinai. Lessons from older settlements and agricultural areas should be brought to bear to accelerate progress toward sustainable and efficient agricultural production. Donors could work with the GOE toward high-quality completion of these projects, which will require that: land and water rights are allocated appropriately and fairly; property registration is comprehensive; and water efficiency is maximized. Donors could work with the GOE to develop and implement allocation and registration policies that do not discriminate against women. Land reclamation policies provide opportunities to allocate land to women and to tenants dispossessed under the 1992 law. The government has recently taken steps to reduce the time and costs of formal registration of property. However, some land remains unregistered and insecure, constraining the ability of many residents to utilize the full potential of the land they possess. External assistance could be helpful in: implementing effective public-awareness campaigns; providing registration and titling assistance to ensure that women, the poor, and other disadvantaged groups are able to register their property; and supporting the development of local institutions that will govern property registration fairly and transparently. Donors could work with Egypt to reduce urban sprawl through an assessment of urban land markets and legal and regulatory impediments to developing land within urban boundaries, including an evaluation of current construction, land-use planning regulations, and zoning enforcement. Donors could also continue to support the GOE in its efforts to improve slum conditions, including efforts to regularize land rights within informal settlement areas. Egypt is already experiencing severe water poverty. The situation is not likely to improve as climate change and population growth combine to raise the risks of inadequate water supplies, conflict over the available supplies, and greater exploration of Nile resources by other members of the Nile Basin Commission. External assistance could help Egypt to assess and adapt to the future consequences of climate change on land, water and other natural resources. Conflicts over land are common in Egypt, creating civil unrest in some cases and impeding a functioning land market in others. External assistance could help Egypt to identify systems to resolve land disputes outside of the formal court system, and to ensure that vulnerable socio- economic groups have adequate access to these systems. A number of Egyptian non-governmental organizations (NGOs) have been instrumental in representing the needs and interests of poor and disenfranchised populations. For example, the Land Center for Human Rights has done an impressive job of documenting natural-resource-related problems of the rural poor and marginalized, and advocating for their rights. Increased donor support for Egyptian NGOs and their efforts could complement support for the Government’s efforts to democratize. Donors could work with NGOs to develop new research on women’s access to justice, including access to land and property. The vast majority of Egypt’s territory is unusable or low-value desert. Its agriculture and population are largely confined to the narrow Nile River Valley and Delta, about 4% of Egypt’s total land area. All of the limited agricultural land is irrigated and most is productive, but significant amounts are being lost each year through degradation and urbanization. The government is countering this trend with massive and expensive efforts to reclaim land from the desert. Agricultural land is scarce, and a combination of population growth and competing uses have reduced agricultural land per capita. Land is relatively equitably distributed due in significant part to Nasser-era land reforms. However, rural landlessness is high and has been recently worsened by a 1992 law (Law No. 96, which was fully implemented in 1997) that eliminated permanent and heritable land rights for approximately 1 million households. In urban areas, despite recent regularization and slum- improvements projects, over 12 million people live in informal settlements; over half of these live in Greater Cairo. Urban boundaries have stretched outward, encompassing agricultural and desert land as urban populations swell. Recent changes to the registration system have streamlined registration processes, reduced fees, and automated records. Prior to these changes (less than five years ago) only about 10% of real property was registered; the effects of the improvements to registration have not been fully realized. Some customary rights are recognized in law, but only individual rights, not the communal rights of tribes or clans, are recognized. While women have the legal ability to own and inherit land, the legal framework and, particularly, social custom discriminate against women, resulting in low levels of women’s land ownership. The agriculture sector is by far the largest user of water, and Egypt’s water use efficiency is slow by regional standards. Egypt faces water quantity and quality problems. Agriculture is by far the largest user of water and some observers consider Egypt’s water-use efficiency to be low by regional standards. The largely centralized system of water irrigation and use is becoming more decentralized, primarily through Water User Associations (WUAs), but this process has been only partially effective. Egypt will need to make serious changes to its water policy and practices in order to meet the water needs for a growing population. The mining industry in Egypt, including petroleum, gas, phosphates and gold, is significant, contributing nearly 15% to the national GDP in 2009. The GOE has worked with the International Finance Corporation (IFC) in recent years to draft a new minerals law and encourage private investment in the sector. As Africa’s second most populous country, Egypt has a total population of 81.5 million (2008) individuals that is growing at 1.7% per year. Fifty-seven percent of the population resides in rural areas, and 29% of the total labor force is agricultural. Gross National Income (GNI) per capita (PPP) is US $4690. Average spending per household doubled between 1995 and 2009. Total GDP in 2008 was US $162 billion. Agriculture comprises 14% of total GDP, while 36% is from industry and 50% from services (World Bank 2009; CIA 2009; El-Sherif and Abdoun 2010). Egypt’s total land area is 100.1 million hectares, the vast majority of which is desert. In 2005, agricultural land comprised less than 4% of total land area. Egypt has almost 3.5 million hectares of arable land and permanent cropland, 100% of which is irrigated. The Nile River Delta and the narrow Nile River Valley comprise virtually all of this irrigated land. Egypt’s agricultural land per capita of agricultural population is among the world’s lowest at 0.1 hectare, comparable to Bangladesh and China. Yet at the same time, prime and limited agricultural land in the Nile Valley and Delta is being lost at a rate of nearly 30,000 hectares per year due to urbanization (World Bank 2010a; World Bank 2008b; El-Hefnawi 2005). Soil degradation due to salinization and agricultural land-loss from desertification is also a challenge. Nearly 809,400 hectares in the North Delta alone have already been lost due to rising groundwater levels, unsound drainage practices, and encroaching sand dunes (Gheit 2008). As much as 35% of the agricultural lands in Egypt may suffer from salinity. The majority of the salt-affected lands are located in the Lower Delta. Indeed, the current situation is serious and threatens not only agricultural sustainability but also the whole ecological system (Kotb et al. 2000). Egypt contains 246 cities, including three with very large populations (Cairo with 21.5 million residents, Alexandria with 12.9 million and Giza with 9.3 million). According to a recent report by the Egyptian government, Cairo is considered the second-most densely populated major city in the world (El-Sherif and Abdoun 2010). around villages and cities; and failure to enforce laws that prevent illegal building on agricultural land. Heavy constraints on land subdivision and change of use (from agriculture to residential or other urban uses) in the formal urban land sector have contributed to large-scale illegal encroachments on agricultural and desert lands over the past four decades. These informal settlements now comprise approximately one-half of Cairo’s residential area (El-Sherif and Abdoun 2010; Egypt Daily News 2006; Madbouly 2005; Sims 2003). Only 0.1% of total land is forested, and 5.3% of Egypt’s land is nationally protected. Deforestation on Egypt’s small amount of forest land is not considered a problem. In 2005, average annual deforestation rate was a negative 2.6% (World Bank 2009). In the decades leading up to 1952, control of agricultural land in Egypt became increasingly concentrated. At the time of the 1952 Revolution, 44% of rural households were landless, and 95% of landowners possessed rights to only 35% of the land (in smallholdings), while a few large farms (0.4% of landowners) possessed rights to 33% of the land. Resistance and demands for land by rural households contributed to political instability (Metz 1990; King 2009). Nasser-era agrarian reforms starting in 1952 were two-pronged. First, the government redistributed ownership rights to some land by setting a maximum ceiling on land ownership, expropriating land above the ceiling, and distributing it in small plots averaging 2.4 feddans (approximately 1 hectare) to about 350,000 families between 1952 and 1970. Second, because not all landless households received ownership rights, the reforms also established rules protecting lessee households, fixing rents at seven times the land tax and granting beneficiary households permanent, heritable tenancy rights. Landlords could not evict tenants unless they did not pay rent, and rent levels became increasingly nominal over time. Furthermore, landlords wishing to sell their land for non- agricultural purposes were required to pay one-half of the sales-price to the tenants. The government registered beneficiaries of the reforms (both lessees and new owners) in records kept at the village level (King 2009; Metz 1990; Madbouly 2005; Prosterman & Riedinger 1987). The land reform was generally considered a success in that it transferred ownership rights and long-term secure leasing rights to a large number of poor households. Ownership rights to more than 300,000 hectares were redistributed, comprising between 12% and 14% of the land under cultivation. In 1981/82 – thirty years after the initial reforms – 32% of landowners in Egypt owned less than 1 feddan (0.42 hectares) of privately held land. This group owned approximately 6.5% of privately held land in the country. Owners with 1–5 feddans (0.42–2.1 hectares) comprised 58% of owners and owned approximately 46.5% of land. Owners with more than 5 feddans (2.1 hectares) but not more than allowed by the legal ownership ceiling – in most cases 50 feddans – comprised 10% of all owners and owned approximately 47% of land. In addition to those who benefited through the receipt of land ownership rights, over 1 million registered tenant households also benefited from steadily improved leasing regulations over three decades following the initial reforms. The combination of long-term tenure security and low land rents gave these households an almost ownership-like interest in the land that encouraged investment and farm productivity (Metz 1990; World Bank 2008b; Seyam and El-Bilassi1995; Rae 2002; Prosterman and Riedinger 1987; Madbouly 2005). In 1992, Law No. 96 reversed key provisions of the 30-year-old pro-tenant reforms by providing for increased rent levels over a 5-year period and removing, by 1997, the permanent, heritable rights of tenant households that were beneficiaries of the earlier reforms. The new law gave landlords the right to evict such tenants for the first time in many decades. The government justified Law No. 96 by the need to increase agricultural production efficiency, attributing stagnation in the agricultural sector to land rents fixed far below market levels, fragmentation of smallholdings, and the practical inability of landlords to sell their land to more efficient producers. While smallholder tenant households often did lack the resources necessary to compete successfully in a market-based economy, some observers point to the fact that the government could have addressed this problem in a number of alternative ways, including making a large-scale effort to increase smallholders’ access to production resources. The law did not affect the holdings of those households that had received land in ownership under the Nasser-era reforms (Bush 2002; King 2009). The implementation of Law No. 96 led to significant levels of rural unrest and dispossession of approximately 1 million longstanding registered tenant households, representing 30% of all farming households in Egypt. Compensation to evicted tenants amounted to a fraction of the value of their land rights. During the same time period, the government auctioned off much publicly owned land at the highest bid price, further reducing the number of small plots. These sales, together with the effects of Law No. 96, caused land rights distribution to constrict: by the end of the 1990s, 7% of the population owned and controlled 60% of the agricultural land. According to most economic indicators, rural poverty and unemployment increased substantially following implementation of the law. In spite of the effects of Law No. 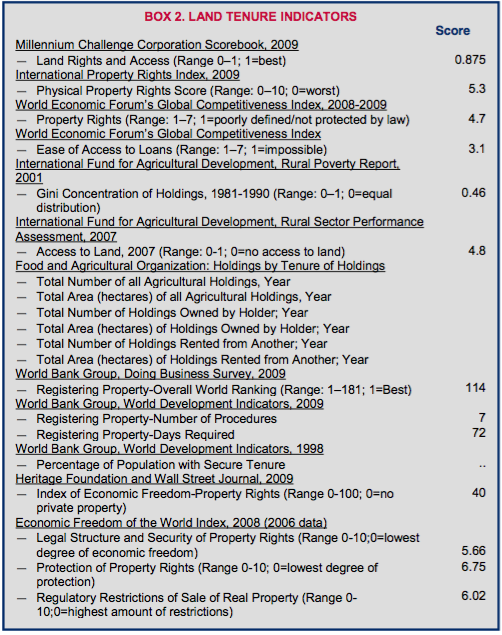 96, Egypt continues to score a relatively high 0.875 on the Millennium Challenge rating for Land Rights and Access (see Box 2 above), which measures the legal, market and institutional framework protecting equitable land access and land tenure, and the costs and time of registering property. The MCC rating does not rate the implementation of legal frameworks (Bush 2002; King 2009; Saber 2006; Madbouly 2005; MCC 2009). Distribution of land rights remains heavily skewed by gender, and a significant amount of land is held by people over age 50. Male holders constituted 96% of the total number of holders in 2000, while female holders constituted only 4% of all holders. Landholders over 50 years of age comprised 43% of all landholders, and those aged between 40 and 50 years comprised 34% (Freedom House 2009, Seyam and El-Bilassi1995). Rural Upper Egypt has the highest incidence of poverty in the country. Half of all poor Egyptians live there. In Upper Egypt, the poorest (lowest two quintiles) are agricultural laborers, landless farmers and farmers owning less than half a hectare (World Bank 2005). Distribution of agricultural land-rights continues to change through government land-reclamation projects. Over the past decade the GOE has funded two large projects aimed at reclaiming 210,000 hectares of desert land for purposes of cultivation in the southwestern part of the country (New Valley Canal Project) and 250,000 hectares in the eastern Nile Delta and northwestern Sinai (El-Salam Canal Project). The government usually allocates rights to this land by starting with a 3-year concession contract that allows the contracting party to demonstrate sufficient capacity and intent to develop the land for agriculture. After three years the contract can be extended for up to 30 years, with the beneficiary paying less than 5% of the total land value annually. After 20 years, the government transfers full ownership rights to the beneficiary. Government agencies have selected approximately 1.4 million hectares for potential reclamation up through 2017 (Madbouly 2005; Kotb et al. 2000; Gheit 2008). Through the Mubarak Graduates Project, begun in the 1980s and expanded since 1988, the government aimed to reclaim desert land through offering small amounts of land to recent university graduates, most of whom studied agriculture. Overlapping goals are to: (1) increase employment among recent graduates; and (2) help to provide alternative sustainable livelihoods to some of those households that lost land under Law No. 96 in 1992. Under the Project, the government sells 5–10 feddans (2.1–4.2 hectares) in the form of a long-term lease, at the cost of providing irrigation. Payments are made annually, and full transfer of land rights occurs upon termination of payments. This project has been responsible for approximately 25% of the land reclaimed since 1988 (Madbouly 2005). In urban areas, many low- and middle-income families cannot afford housing in the public sector, largely because of limited access to affordable developable land. According to 2007 data, 12.2 million people live in a total of 870 informal settlements in Egypt; approximately one-half of these live in Greater Cairo. Over the past decade, the GOE has prioritized reducing the number of slum-dwellers and has, to this end, pursued regularization and provision of basic service to slums and squatter settlements. According to recent reports, the number of slum dwellers in Egypt decreased from 28.1% of the urban population in 2000 to 17.1% in 2010, indicating an improvement in living conditions for approximately 5 million people (El-Sherif and Abdoun 2010; UN-Habitat 2006; UN-Habitat 2010). The Egyptian Civil Code is the primary source of civil law in Egypt, including property law. The Civil Code, first adopted in 1949, integrated materials from old Egyptian codes and incorporated material from the shari’a and from European and American law. It relegates the shari’a to third place as a general source of law, after the formal legislation and case law precedent. Personal property or status issues (including divorce, inheritance, marriage and child custody) are governed by shari’a, and shari’a also inspires the values behind Egypt’s secular legal framework. Under most interpretations of shari’a, daughters inherits half of the land their brothers inherit. And, because there are many additional complex share rules under shari’a, a property may be subdivided into minute parcels for each inheritor (Hansen 1991; BBC 2008; UN Habitat 2005). The legal framework for land rights distribution in Egypt began with Law No. 178 of 1952, which limited the total amount of landholding per household to 200 feddans (84 hectares) and redistributed excess holdings to poor rural households. The law also established a rent ceiling at seven times the land tax value (amounting to approximately 15–20% of the gross crop value). Further laws in 1961 and 1969 consolidated reforms by reducing the ceiling on landownership to 100 feddans (42 hectares) and 50 feddans (21 hectares) respectively, although these laws retained higher ceilings for families with children (King 2009; Prosterman & Riedinger 1987; Metz 1990; Madbouly 2005). Law No. 96, adopted in 1992, reversed two key components of the 1952 reforms by increasing rents and eliminating permanent, heritable rights of tenants (Bush 2002; King 2009). The ownership of land by foreigners is governed by three laws: Law No. 15 of 1963; Law No. 143 of 1981; and Law No. 230 of 1996. Foreigners may not own agricultural land, but they may own residential real estate within certain limits (Yehia 2007). Legislation implemented between 1988 and 1996 governs rights to desert land. Law No. 143 and its amendments govern the acquisition and ownership of desert land, defined as land two kilometers or more outside the border of the city. Limits are placed on the area owned. Further, the lease of such land for more than a period of 50 years shall be considered to be ownership under Law 143. Law No. 5 of 1996 concerns the right of free disposal of public and private desert land, and has several key components: public desert areas can be rented at nominal rates for investment projects; the transfer of property must be completed after the realization of the project and effective production; the rent period must not exceed 40 years, and is renewable as long as the project continues; and such land is to be used only for the designated objective (Ecolex 1996; Yehia 2007). Cadastral surveying, mapping activities, and property registration are primarily governed by Law No. 114 of 1946 on Regulating Real Estate Registration and Law No. 142 of 1964 on In Rem Registry (or Title Registration) (Taylor 2005). The Mortgage Finance Law No. 148 of 2001 established the basis for mortgage financing and succeeded in opening the door to more homeowners through development of a mortgage market (Struyk 2007). A patchwork of laws governs customary rights to land. Some customary rights are recognized in law, but only claims by individuals are recognized, not those by tribes or clans. The actual operation of customary rights occurs primarily along the northwestern coast, where the Bedouins and others have reclaimed land (sometimes many decades ago) and assumed control over it in the absence of a written contract or deed. In 1958, the State passed Desert Law No. 124, which removed all legal recognition of customary rights and instead provided for reliance on cadastral registration of land title. Six years later, Law No. 100 partially reversed this by allowing acknowledgement of customary title where trees were planted prior to 1956. In 1969, the state nationalized all unregistered land and made it available for sale or lease to individuals or companies. A 1981 law legitimized customary claims to nationalized lands where land had been improved and where land had 40 seedlings, provided that a system of irrigation was in place prior to 1981 (Rae 2002). The Civil Code codifies some traditional rights to land, such as the right of preemption known as shufa. Per shufa tradition, the Code gives a neighboring landowner the right of first refusal at the time a land plot is sold. This right is only triggered, however, if the neighbor’s plot adjoins on two sides the land being sold, and the value is at least one half of the value of the plot being sold. The purpose of this law is to promote land plot consolidation (Madbouly 2005). Private ownership (freehold). Freehold land is land registered with the local district office of the Land Registration Division and owned by private persons or companies. The great majority of agricultural land is privately owned, especially in the older, settled rural areas. All land not registered to private entities is technically considered to be publicly owned, although informal tenure of unregistered land in some areas is in fact considered to be quite secure. There are several restrictions on agricultural landholdings. Law No. 50 of 1969 provides that an individual cannot own more than 50 feddans (about 21 hectares) of agricultural land (or its equivalent in uncultivated and desert lands) and that a family cannot own more than 100 feddans (about 42 hectares) of agricultural land. The law prohibits construction of any buildings on farmland without a license from the Ministry of Agriculture and Land Reclamation. Public ownership. Land registered as state property and not leased to a private entity is publicly owned. Land under public ownership falls into two categories: state domain, which includes desert or unclaimed lands and is administered by the governorate; and public domain, which serves a public utility such as rivers, roads, military installations, land for antiquity sites, and land set aside for development. Publicly leased land. Land owned by the state can be leased on a long-term basis to its occupants. These leases apply in a number of circumstances, most importantly for land in reclaimed areas and for squatters (through a request to the governorate). In reclaimed areas, lease rates are capped (e.g., at the cost of irrigation or at 5% of the total land value) and rights may convert to ownership rights after a specified period of time. Trust or Waqf land. Trust land is land set aside by the state for charitable or religious purpose and usually administered by the Ministry of Waqf. The purpose for categorizing land as Waqf is to prevent subdivision and to eliminate conflict among descendants. The revenues from the land belong to the beneficiary; Waqf land cannot be sold or mortgaged. Encroachment (Wad Al Ayad). The Civil Code makes it possible for the possessor or user of a plot of land to gain ownership of that land if it is occupied continuously for 15 years without the owner asserting rights. (Madbouly 2005; El-Hefnawi 2005; FAO 2000; Ziadeh 1978; UN-Habitat 2007). Egypt’s land-tenure system revolves around shuyu’, a collective property system under which heirs own shares of property. Under shuyu’, inheritance can be delayed for generations pending the agreement by all heirs on the division of the land rights and/or alienation of subdivided and registered plots. Protracted conflicts are common. Regardless of how many family members own shares, most land-rights documents are issued solely in the name of male heads of household, as further discussed below (Freedom House 2009; Nazir and Tomppert 2005). In the informal sector, home to an estimated 12.2 million people in urban areas in Egypt and many additional rural residents, tenure arrangements vary. The primary informal tenure arrangements concern: (1) settlements on former agricultural land; and (2) settlements on former desert land (Sims 2003). In the first case, private residents in the 1960s began building their homes on agricultural land purchased from farmers, without subdivision plans or building permits. Beginning in 1978, the government adopted a series of laws that made it illegal to build on agricultural land, and in 1996 made it a criminal offense. Building on agricultural land continued, however, resulting in a significant loss of such land, especially on the urban fringe. Plots are generally small, averaging 80 square meters. Although land rights are not legally recognized in these settlements, they are in general politically recognized and considered secure (Sims 2003; UN-Habitat 2007). In the second case, private residents developed state-owned land in desert areas, per a tenure type known as hand claim. These settlements usually started with a small core, then expanded as developers walled off large plots on the fringes of the core, which they subdivided and sold. Although this process has occurred outside of formal written law, residents derive customary rights to their land and housing under Civil Code provisions on establishing hand claims in the desert. The government imposes a nominal rent on residents, called tahkir. Settlers compile documents to support their claims, including receipts from payments of tahkir, property tax, or utility bills. Because hand claim rights are established by one legal property owner and usually do not have a complex history of transactions, subdivisions or inheritance, regularization of these is relatively simple (Sims 2003). Ownership of land may be secured through inheritance or purchase. Land may also be leased from the government or private owners. The government also grants types of land to private individuals and entities, for example through reclamation projects or in some cases through granting rights to squatters (Ziadeh 1978; Hansen 1991; Madbouly 2005). Egypt applies two systems for registering properties: a title registration system and a deeds recordation system. The title registration system (called sejel ainee and introduced by Law 142 of 1964) is applied in rural areas. Its application began in 1976. The government estimates that 70–80% of agricultural lands are covered by the title system. The deeds recordation system (called sejel shakhsee and regulated through Law No. 114 of 1946) historically covered the whole country, but is now primarily in use in urban areas. Under the title registration system, failure to update records has in many cases clouded ownership rights. Rights to some land plots are still registered in the names of the original owners at the time of the first cadastre, nearly 100 years ago. In these cases, owners must attempt to prove the ownership chain through registered landlord-tenant contracts, but these records have often been marred by forgeries (Megacom 2005; Madbouly 2005). Recent reforms to Egypt’s land registration system are expected to radically increase the amount of registered land. In the past, the cost of registering land prohibited many people from doing so, and large amounts of land have not been registered. Until recently, registering title in urban areas required 77 procedures, took between 6 and 11 years, and cost between 7% and 12% of the property’s net value. Even the most simple transaction took, on average, 93 days to register. It is thus estimated that only about 10% of urban properties were registered in Egypt as recently as five years ago. In Cairo, only 5% of the roughly 3 million real estate properties were registered in the paper-based deeds system (Rabley 2008; Taylor 2005; Amberlamb 2006). The reforms have streamlined the property registration system, so that it now requires seven procedures, takes 72 days, and costs less than 1% of property value to register land rights in Egypt. The procedures for registering property include: (1) buyer presents request for registration; (2) measurement department inspects the site; (3) buyer pays for the inspection report, which is then issued; (4) Lawyers Syndicate drafts and approves the final contract; (5) buyer obtains the contract from the Real Estate Registry; (6) seller and buyer sign the contract before the Real Estate Registrar; and (7) buyer picks up the new contract/title at the Registry. Reforms have included establishing an electronic records system that helps buyers and financers to determine correct ownership. In 2008 the World Bank’s Doing Business report dubbed Egypt the top economic reformer in the world, due largely to its reformed property registration systems (World Bank 2008a; USAID 2009). Although women have the same legal rights as men to register land rights, they seldom do. This is in part because proving land tenure requires documents usually issued to men, such as official registration, tax receipts, records of crop delivery or records for registration with local village associations if the property was rented. 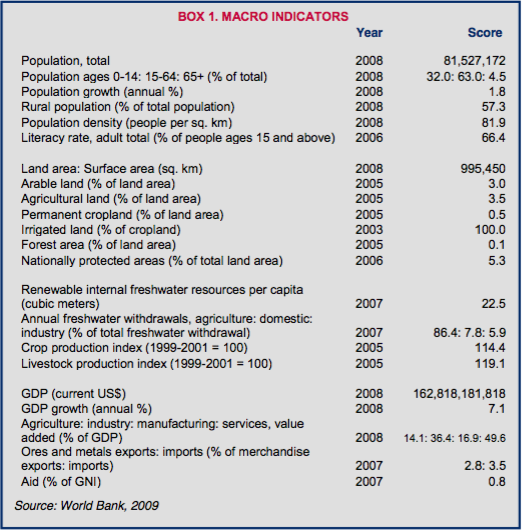 See further discussion below (Freedom House 2009; FIG 1999; Nazir and Tombbert 2005). The rules of succession and inheritance in the Civil Code are primarily derived from the shari’a law. A maximum one-third of the estate can be dispersed through a will. In an attempt to encourage family joint ownership and to prevent fragmentation, the Civil Code requires agreement of all co-owners prior to sale of any share (Madbouly 2005). Law No. 96 shifted tenure security away from agricultural tenants and toward landlords. It gave landlords the right to raise rents, to sell their land, and to evict tenants, while removing the high degree of tenure security enjoyed by tenants since the 1950 reforms (Bush 2002; King 2009). Squatters may improve their tenure security by either petitioning the governorate for lease rights, or by seeking ownership rights through the law of encroachment, as set forth in the Civil Code. The relatively small amount of land held de facto by customary tribes or clans, mostly by Bedouins, is insecure in legal terms because the law does not recognize land claims by tribes or clans. Because the Bedouins have culturally recognized claims to the land, however, an outsider would likely have to purchase any piece of land in Bedouin territory first from the Bedouins and second from the government (Rae 2002; Madbouly 2005). The 1971 Constitution guarantees equality to all citizens and confirms women’s rights to inherit and own property. Ownership rights in Egypt are governed by the Civil Code, which affirms women’s rights to own, inherit and independently use property. Thus formal laws in Egypt grant women equal status to men in the ownership and control of land, as reflected in the low scores Egypt achieves in the OECD’s database measuring gender inequality, noted in Box 3. (The OECD rankings are based on the question of whether or not women can own land and property, as indeed they (legally) can in Egypt.) However, tradition in Egypt dictates that property, contracts and leases should be managed by the father or husband; information on women’s legal rights to land is lacking; and male household members often buy out or usurp women’s rights. The government estimated in 2000 that 96% of landowners were male (Freedom House n.d.; LCHR 2004; Nazir and Tomppert 2005). Islamic law of succession codified by the Civil Code allows daughters to inherit land, but with only half the share of sons. Although Muslim widows with young children may assume control of their husband’s land rights upon his death, these rights may be superseded by those of the oldest son (for example from a previous marriage). Christian widows have no inheritance rights to their deceased husband’s estate. Often a widow appoints a male guardian to manage her land rights (Freedom House 2009; Navir and Tomppert 2005). The shuyu’ system (by which heirs own property collectively, in shares) has typically favored men; women have often been forced or pressured to give up their inheritance rights to their father or brothers, although this is not always the case today. Even though ownership of property is becoming more and more common for Egyptian women, the majority of properties are registered in the father’s or the husband’s name, regardless of whether or not the woman bought the property entirely with her own funds or contributed money toward the purchase (Qvist 1995; LCHR 2004; Freedom House 2009; Navir and Tomppert 2005). Women’s rights to property are very insecure. A widow may choose not to marry, or choose to remain in her house after their husband’s death in order to strengthen her and her children’s claim to inherit it. Traditionally men own homes or other buildings, and traditional dictates that men are responsible for providing for their families. While women may inherit a home, there is incredible social pressure to give it to her male relatives. In the case of a property dispute over this matter, traditional authorities will often favor men (FAO Gender and Land Database 2010). Prior to Law No. 96, women could inherit the contractual rights to agricultural land rented by their husbands. However, because the law gave more power to landholders and did away with rent control and inheritance, women of tenant families became more susceptible to being landless, and implementation of the law resulted in the eviction of some women heads-of-household (Bush 2000; Madbouly 2005). The government’s efforts to allocate newly reclaimed desert land to qualified citizens could target increasing the number of women landholders, but in fact policies have discriminated against women by requiring female candidates to be married. Only 20% of such land has been allocated to women (LCHR 2004). The Ministry of Agriculture and Land Reclamation (MALR) is charged with protection of agricultural land in Egypt, and has responsibility over agricultural land and water. For desert lands, the General Authority for Reconstruction Projects and Agricultural Reclamation (GARPAR) is the main governmental body responsible for managing, developing and disposing land for agricultural and reclamation purposes. GARPAR, which reports to the Ministry of Agriculture and Land Reclamation, controls lands slated for reclamation and arable lands within villages that are not privately owned. The governorate, however, controls desert lands within village boundaries and in adjacent lands up to two kilometers outside of the village, unless the land is earmarked for national use (Madbouly 2005). The Real Estate Publicity Department (REPD) of the Ministry of Justice manages the existing deed-recording process (Rabley 2008). The Land Registry Office and the Egyptian Survey Authority (ESA) under the Ministry of Water Resources and Irrigation are responsible for maintaining land records and for official surveys, mapping and cadastral work. Also, the Ministry of Communications and Information Technology assisted with collating maps and real estate details into a central database, in order to fully automate the land records system (Taylor 2005; GOE 2009; World Bank 2008a). The Ministry of Waqf controls land designated as waqf (Madbouly 2005). Egyptian land markets appear to be relatively more developed in urban and tourist areas than in rural areas. Formal-sector real-estate prices in Cairo are considered high by global standards, although average housing prices in this sector fell by 37% between the end of 2008 and the end of 2009 (from US$ 439,560 to US$ 274,725, depending on the neighborhood) in response to changes in the global financial climate. Recent reforms to the real estate registration and financing systems are expected to increase market activity over time (Amberlamb 2006; Megacom 2005; El-Sherif and Abdoun 2010; GPG 2010). In rural areas, land transactions are carried out through sales or lease (with either cash or in-kind payments). Agricultural land rentals increased substantially in the 5-year period after full implementation of Law No. 96 began in 1997. In-kind leasing arrangements including sharecropping increased sharply after the law was passed and implemented. Average cash payments for leasing rose from approximately 100 EGP/feddan in 1992 to 3000 EGP/feddan in 2005. Although one of the explicit aims of Law No. 96 was to bolster agricultural land sales, it does not appear that this occurred in the 5-year period following full implementation of the law. Due to the absence of available data, it is difficult to know whether changes have transpired subsequent to this time although improvements to the market have not been widely noted (Bush 2002; Saber 2006). Impediments to market transactions have included a cumbersome registration process (although recent changes have attempted to improve and streamline this process) and the tradition of shuyu’, whereby a number of heirs inherit land rights to a particular plot in shares and transacting the land requires unanimous consent of all co- owners (World Bank 2008a; Freedom House 2009; Nazir and Tomppert 2005). Following the passage of Mortgage Finance Law 148 in 2001, the growth of a mortgage market and acceptance by banks has been slow to materialize due to concerns about foreclosure laws, property registry, risks in lending in an untested market-sector and extension of credit beyond current market depository instruments (i.e., certificates of deposit) (Struyk 2007). Foreigners can transact land rights in Egypt, subject to certain restrictions, but they cannot own agricultural land. The GOE has recently amended financial regulations to encourage foreign investment in real estate. Per Decree 548 in 2005, intended to boost investment in the tourist sector, the GOE exempted foreign real estate investments from inheritance and capital gain taxes. Foreigners can own two pieces of real estate less than 4,000 square meters (Intermark Savills 2005; Foreman 2009; Yehia 2007; Global Property Guide 2008). The general provisions guiding expropriation of private property are governed by Law No. 27 of 1956, Law No. 252 of 1960, Law No. 577/54, and Law No. 10 of 1990. Land may be expropriated only for realizing public interest (Egyptian Natural Gas Holding Company 2007). The Civil Code states that uncultivated land that has no owner is the property of the state, and acquisition of ownership rights to uncultivated land is subject to the state’s authority (Ziadeh 1978). Per Law No. 50 of 1969, the government has the authority to acquire private land held in excess of ownership limits, which is then granted or leased to small farmers. Owners are compensated for their land with bonds worth 70 times the land tax (Ziadeh 1978; Metz 1990). Disputes over rural land are common in Egypt. Frequent causes of disputes include contested land ownership and inheritance claims, contested land boundaries, and issues concerning irrigation. In regard to the latter, small farmers have often argued that the government treats them unfairly in distributing irrigation water, shortchanging those who live at the end of canals. The government has attempted to address some of these concerns by decentralizing authority over water-distribution to local Water User’s Associations (WUAs). Some Egyptians also complain that the government focuses its resources on new reclamation projects, while neglecting water shortages on agricultural land currently farmed by millions of small-scale (and mostly poor) farmers (LCHR 2000; Murphy 2005; Allam 2004). Conflicts over land ownership rights increased in the wake of Law No. 96. Reports document violence in Egypt’s countryside relating to the implementation of the law through the 1990s and into the new millennium. The Egyptian NGO Land Center for Human Rights (LCHR) has documented numerous annual deaths, injuries and arrests related to implementation of the law through 2003, and international news reports stated that land-based disputes were on the rise in 2005. Subsequent information is not available. LCHR alleges collusion between the government and large farmers in the forceful eviction of tenants (LCHR 2000; Saber 2006; Bush 2002; Murphy 2005). The Civil Code allows land disputes to be adjudicated by the courts. Possession, ownership and other real rights in immovable property are regulated by the law of the place in which the immovable property is situated. In the absence of an applicable law the judge will base his decision on custom, and, in the absence of custom, on principles of Muslim law. The courts are of limited use to the rural poor, however, many of whom understand neither the legal/judicial process nor their rights to land. Illiteracy in rural areas further minimizes access of the poor to the formal court system, as does the inability to pay court-related expenses. Some observers claim that the police and large landowners have purposefully blocked rural tenants and others from accessing the courts over land disputes (Ziadeh 1978; Murphy 2005). The GOE has gone to extensive lengths to reclaim desert land for agriculture. The government reclaimed approximately 1.92 million feddans (806,400 hectares) of desert land between 1952 and 1987, and an additional 627,000 feddans between 1987 and 1991. Historically, land reclamation has been the government’s second- greatest agricultural investment, behind irrigation, consuming 30–35% of the agricultural budget. Of lands reclaimed, approximately 40% have been lost to re-desertification. Current reclamation projects seek to cultivate 210,000 hectares of desert land in the southwestern part of the country (New Valley Canal Project) and 250,000 hectares in the eastern Nile Delta and northwestern Sinai (El-Salam Canal Project). Government agencies have selected approximately 3.4 million feddans (1.4 million hectares) for potential reclamation through 2017. Notably, Egypt has not made efforts to increase the price of water for irrigation, which may undermine efforts toward conservation of both water and irrigated agricultural land over time (Metz 1990; Madbouly 2005; Kotb et al. 2000; Gheit 2008; Allam 2004). Over the past few years the Egyptian government has taken measures to develop a land market and create a mortgage market by: establishing a transparent system to protect property rights and streamline real estate registration; facilitating foreclosure procedures; improving housing affordability; and reducing lending and funding risks for mortgage lenders and investors in mortgage securities (World Bank 2005; World Bank 2008a). In 2005, the Ministry of Communications and Information Technology began collating maps and real estate details into a central database, a project that has since resulted in full automation of the land records system. The intent of this Corporeal Agricultural Land Registry automation project was to enable more efficient settling of ownership disputes and better protect both state and citizens’ rights. Also the Land Registry Office and the Egyptian Survey Authority (ESA) are creating simplified automated procedures and services for electronic transfer of ownership of agricultural lands (GOE 2009; World Bank 2008a; USAID 2009). USAID has spent nearly US $1.3 billion on the agricultural sector in Egypt over the past three decades, including efforts to extend credit to small farmers, improve irrigation systems and water-use efficiency, and increase productivity and farmer incomes. Most recently, USAID has focused on real-estate finance reform, including professionalizing originating mortgages, modernizing real estate financing instruments, developing a dependable property registry, and establishing a credit information service (USAID 2004; Rabley 2008; USAID 2010a; USAID 2010b; USOIG 2009). The International Fund for Agricultural Development (IFAD) has financed US $250 million in projects in Egypt, with a focus on improving agricultural production and reducing poverty in both long-settled and newly-settled areas. IFAD’s recent projects provide post-settlement and agricultural support services to smallholder beneficiaries of Egypt’s land reclamation projects, and include a strong gender component. In 2010, IFAD launched a US $48 million project aimed at increasing water-use efficiency and crop production on small farms (IFAD 2007; IFAD 2010). In 2006 the World Bank approved a loan for The Egypt Mortgage Finance Project that enables banks and non-bank lenders in the primary market to begin offering long-term market-based mortgage loans for residential housing. The Egyptian Company for Mortgage Refinancing (ECMR) legally incorporated as a joint stock company during project preparation with the assistance of the World Bank, and receives the proceeds of a World Bank local currency loan as a line of credit (World Bank 2006; World Bank 2010b). In 2002, the Finnish government funded a project called Egyptian Cadastral Information Management Project which was established to improve the system linked to land registration and taxation in urban areas (Taylor 2005; Elrouby et al. 2005). Egypt is highly dependent on water from the Nile River, obtaining 95% of its total water supply from this source. National food security hinges on water availability, and most agricultural land depends for its fertility on access to waters from the Nile. The completion of the Aswan High Dam in 1968 held marked consequences for Egypt’s access to water for agriculture and municipal use. While the dam allowed Egypt to control flooding, and increased the amount of water available for irrigation, it also resulted in raised water tables and problems with drainage. Per a 1959 agreement with Sudan, Egypt has the right to use 55.5 cubic kilometers of water from the Nile each year (Fahmy 2002; Kotb et. al 2000; Madbouly 2005; Oosterbaan 1999; Hamza and Mason 2004). A second source of water is the groundwater held in six aquifer systems in Egypt, which include the deep groundwater of the Nubian Aquifer reservoir in the Western Desert. Although this aquifer contains vast quantities of water, it lies at depths of 1500 meters and is difficult to access. It is estimated that this water can be mined at a rate of approximately 4 billion cubic meters per year for the next 100 years (Fahmy et al. 2002; Hamza and Mason 2004). Total water withdrawal in 2000 was estimated at 68.3 cubic kilometers. This included 59 cubic kilometers for agriculture (86%), 5.3 cubic kilometers for domestic use (8%), and 4.0 cubic kilometers for industry (6%). New irrigation projects, including the Northern Sinai irrigation project and the New Valley Project (planned for completion 2017) will require an additional 9.4 billion cubic meters of water (FAO 2000; Shinn n.d.). Egypt’s water delivery system is immense, distributing water for agriculture, municipal and industrial use, generation of hydroelectricity, and navigation of freighters and tourist boats in the Nile. Water delivery infrastructure includes: the Aswan High Dam; eight main barrages; approximately 30 kilometers of public canals; 17,000 kilometers of public drains; 80,000 kilometers of private canals and farm drains; 45,000 private water pumps; 22,000 public water control structures; and 670 large public pumping stations for irrigation. Irrigation methods vary: flood irrigation is most common in the old lands, whereas more efficient, technological methods such as drip irrigation are more common in the newly settled, reclaimed lands (Madbouly 2005; Hamza and Mason 2004). Egypt is facing serious water shortages in the coming years. The share of water per capita in Egypt was approximately 922 cubic meters per year in 1990, which placed it below the water poverty level (1000 cubic meters per year) accepted by the World Bank. It is predicted that per capita water resources will fall to 337 cubic meters by 2025. Under current water management and agricultural practices, up to 60% of agricultural lands can be irrigated. Causes of water shortages include ineffective water policies, water-intensive crop choices, increased population, and reclamation programs. Some observers think that Egypt’s water supplies are secure at least until 2017 given current GOE policies, but that securing water for the long term after 2017 will require balancing the water needs of many sectors, including agriculture and industry (Madbouly 2005; Hamza and Mason 2004; Fahmy et al. 2002). Egyptian agriculture features the lowest level of water productivity in the Middle East/North African region, at the price of about US $0.20 per cubic meter. However, because Egypt reuses much of the water drained off through irrigation (approximately 4 billion cubic meters per year), which returns to the Nile for downstream use, the country has a relatively high overall irrigation efficiency rating. Still, overuse of water is a major problem in Egypt, and current agricultural practices are not considered sustainable. Other problems associated with overuse include water-logging (which creates health issues for rural families), salinization, and decreased soil fertility and productivity. Another unique problem Egypt faces is the corrosion of antiquities (including walls, foundations and columns) by rising groundwater tables and increasing salt concentration in the surface soils, which are worsened by poor sewerage treatment (World Bank 2005; Oosterbaan 1999; Madbouly 2005; Gaballah 2000; ScienceDaily 2001). The greatest opportunities for maximizing productive capacity of water resources in Egypt may be continued focus on reuse and increased efficiency through demand management (primarily through local WUAs). The GOE estimates that it could make available an additional 20.9 cubic kilometers per year through greater focus on water recycling, and by changing irrigation practices, crop choices and crop patterns in order to improve water-use efficiency. Some observers have also noted that applying a tariff to agricultural water could help to improve efficiency. Such tariff could be linked to the land tax, and could encompass the costs of drainage and irrigation systems (Hamza and Mason 2004; Madbouly 2005). Water quality is of ongoing concern in Egypt, especially for areas downstream of Cairo and for groundwater. Household wastewater is often discharged untreated into the waterways; agricultural pollutants such as saline, nitrates and agrochemical residues flow back into both surface and groundwater; and industrial pollution contaminates water sources, although some reduction has been noted due to compliance with environmental laws. Many lakes are so polluted that fishermen are losing their livelihoods. Poor access to improved sewerage in rural Egypt threatens the water quality. Eighty-five percent of urban Egyptians have access to improved sanitation facilities, while only 47% of rural people have access. Most rural households make their own septic tanks, which often produce effluent that seeps into the soil and underground water (Madbouly 2005; Hamza and Mason 2004; World Bank; Arab Environment Watch). According to most interpretations of Islamic tradition, water cannot be sold. Consumers may be charged for the delivery of water, however, as is the case in Egypt for potable water and irrigation water in limited situations on some reclaimed lands. Egypt’s water costs are low for individual consumers and farmland irrigation because they are heavily subsidized by the government. A cubic meter of water is $0.04 on average for individual usage of 10 cubic meters per month. (Madbouly 2005; Kebiri n.d.; OECD 2007). Law No. 12 of 1984 and Law No. 213 of 1994 establish the legal basis for irrigation and drainage. Law No. 213 of 1994 established the legal basis for WUAs, and Ministerial Decree No. 14900 of 1995, issued by the Minister of Water Resources and Irrigation, gives greater detail about WUAs’ authority and responsibilities (Hassabou and El-Gafy 2007). Resolution No. 1383 of 2005 concerns protection of the Nile River and the coasts. It entrusts the Ministry of Irrigation and Water Resources with the control of the Nile River (Ecolex 2005). Egypt’s use-rights to the Nile River water are established per treaty with Sudan. Based on a 1959 agreement, the country has a fixed annual quota of 55.5 billion cubic meters of waters that are regulated by the High Aswan Dam (Fahmy 2002; Kotb et. al 2000). In arid Egypt, water ownership is vested in the state and rights to its use are generally determined by rights to land. Rights to the use of water from canals constructed by the State have under the Civil Code generally accompanied, and been in proportion to, the land holding to be irrigated and are also transferable when ownership of the land holding changes. However, the State has retained ultimate powers to modify water distribution – and hence accompanying subsidiary water rights—in accordance with national objectives, reflected for instance in priority to urban and industrial User’s (Adams et al. 2006). Water within an irrigation system is distributed according to a schedule. Water distribution within small irrigation canals is often governed by local WUAs (Madbouly 2005). Women and female-headed households are vulnerable in irrigation-water distribution. WUAs are dominated by men. As of 2000, there was not a single woman member of any of the 2900 WUA boards. Although a small number of women have since been elected to the WUAs, women’s participation remains limited for a number of possible reasons, including: (1) irrigation has traditionally been considered a male activity in Egypt; (2) only a small percentage of women hold title to their land, a requirement for membership in most WUAs and an important factor in accessing loans to purchase water pumps; (3) women who do hold title to their land usually appoint a male relative to manage the land; and (4) social norms limit women’s ability to participate in WUA formation and activities (Madbouly 2005; IDRC 2009). Water rights and delivery of irrigation water have been heated topics in rural Egypt, provoking disputes and unrest. Shortage of irrigation water and insufficient accessibility to the farmers at the ends of small canals, and the limited supply of water alongside the main canals creates disputes among farmers. In some cases tribal, social and political influence have determined water distribution priorities at the expense of the poor and, especially at the expense of female-headed households. The WUAs were created in part to increase equity in local water distribution, and in many cases have achieved this aim (Madbouly 2005; LCHR 2005; Hassabou and El-Gafy 2007). Along the northern coastal region, clan-families that construct cisterns to gather water have a customary right to the water in that cistern (Rae 2002). The Ministry for Water Resources and Irrigation (MWRI) is responsible for managing the waters of the Nile, including irrigation canals, drains, and groundwater. MWRI also has authority over the implementation, monitoring and evaluation of the transition to WUAs (Fahmy 2002; Hassabou and El-Gafy 2007). The Ministry of Agriculture and Land Reclamation (MALR) is charged with protection of agricultural land in Egypt, and has responsibility over agricultural land and water. MALR includes the General Authority for Reconstruction Projects and Agricultural Reclamation (GARPAR), which is the main governmental body for managing, developing and disposing state land for agricultural and reclamation purposes (Madbouly 2005). The Ministry of Housing, Utilities and Urban Development develops public housing projects and is responsible for urban planning issues related to urban housing and urban development (Ministry of Housing). Beginning in the mid 1990s, the GOE has shifted emphasis from its role as the central actor in developing and managing agricultural water-supply systems towards promoting participatory approaches in which water users play an active role in the management of irrigation systems and cost-sharing. Toward this end, the government has taken important institutional and legislative measures to create local WUAs and Water User’s Unions (WUU). The WUAs and WUUs are groups of farmers who, accessing water through a common source, join forces in the allocation, distribution and management of the water. WUAs are used in the old, settled areas while WUUs are used in the new reclaimed areas. The primary purposes for creating these groups were to improve water delivery to small irrigation canals (mesqas), to better operate and maintain the mesqas, and to improve on-farm water-use efficiency. WUAs and WUUs have reportedly decreased the costs of irrigation, increased agricultural productivity, and increased equity in distribution of irrigation water (FAO 2000; Madbouly 2005; Allam 2004; Hassabou and El-Gafy 2007). In 2004, the GOE consolidated the public drinking-water authority held at the governorate level into a private Holding Company with central operations in Cairo. The Holding Company is considered public property but with a private sector mandate: it must efficiently deliver water to and collect sewerage from a broad customer base without public subsidies, and is subject to the laws governing the private sector. Price-setting has been challenging for the Holding Company, as it must balance the need for financial sustainability with the limited ability of poor households to pay tariffs. The State’s Regulatory Agency for Water and Waste and the Customer Protection Agency help to determine pricing and to evaluate the operations of the Holding Company (Kebiri n.d.). To cope with Egypt’s water challenges, the Ministry of Water Resources and Irrigation (MWRI) has developed a National Water Resources Plan (NWRP) comprising three major steps: (1) development of additional water resources and cooperation with the Nile Basin Riparian countries; (2) making better use of the existing water resources and increasing water-use efficiency; and (3) protection of water quality and the environment. The planning horizon covers a period of 20 years from 1997 up to 2017 (Abdel-Gawad 2006; Hamza and Mason 2004). Egypt has worked with many donors to develop and implement the Irrigation Improvement Project (IIP), a nation- wide program begun in 1984 by the Ministry of Water Resources. Goals of the IIP included: improving irrigation efficiency at the mesqa and farm levels; increasing local participation in irrigation management; and decreasing public costs for irrigation. This project has encompassed the development of the WUAs (IDRC 2009). As discussed above, the GOE continues to implement an aggressive land-reclamation policy, which includes the building of water-delivery infrastructure. It is not yet clear what percentage of the public costs accrued toward this end will be recuperated by private beneficiaries in the new settlements (Madbouly 2005; Gheit 2008; Allam 2004). Over the last five years, the GOE has privatized water-delivery and sewerage services, as discussed above. Egypt participates in the Nile Basin Initiative (NBI), formed in 2000 among countries that share the Nile River Basin (Burundi, the Democratic Republic of Congo, Ethiopia, Kenya, Rwanda, Sudan, Tanzania and Uganda). The Initiative’s mission is: To achieve sustainable socio-economic development through the equitable utilization of, and benefit from, the common Nile Basin water resource (NBI 2009.) Goals include expanding a shared knowledge base regarding the river and the needs of the 160 million people who inhabit the Nile River Basin, and to increase cooperation, hydroelectricity generation and regional trade among member countries (NBI 2009). USAID has directed over US $3 billion to water and wastewater infrastructure projects in Egypt since 1975. Projects have included: construction of water and wastewater treatment systems in many areas of the country; improving water utilities’ cost-recovery and revenue-generation; extending affordable water-delivery systems to villages and to individual rural households; raising hygiene-awareness in rural areas; and increasing private-sector investment in the water sector (USAID n.d.; IWRMP 2008). Between 2004 and 2009, USAID assisted Egypt to establish integrated water-management districts responsible for 1.2 million feddans (15% of irrigated land), and to formulate 600 WUAs for 500,000 water users in 27 districts, which allowed farmers to participate directly in managing the irrigation systems, participating in infrastructure maintenance, educating the public, and resolving conflicts (USAID 2010c). The World Bank loaned Egypt over US $200 million for The West Delta Water Conservation and Irrigation Rehabilitation Project. The objectives are to improve the livelihood and increase the income of people in the West Delta region of Egypt through: (1) mitigating further environmental degradation caused by excessive drawdown of the groundwater resources; and (2) establishing a framework for financial sustainability of irrigation infrastructure in the use of water resources. The Bank is currently working on several pilot projects in irrigation and sanitation that seek to increase the role of WUAs and establish partnerships through the International Finance Corportation (IFC) and the International Bank for Reconstruction and Development (IBRD) (World Bank 2007; World Bank 2010b). In 2010, IFAD launched a US $48 million project aimed at helping small farmers increase their water-use efficiency and crop production. The project targets 79,000 households in poor rural communities (IFAD 2010). Egypt has no natural forests. Egypt maintains 70,000 hectares of forest lands, comprising only 1% of Egypt’s total land area. Because of the prevailing arid climate, almost all the trees that are estimated to exist in Egypt are on irrigated lands and within urban areas. The most common tree species in Egypt are casuarinas and eucalyptus. One hundred percent of the country’s forests are defined as subtropical. Most tree plantations in Egypt are irrigated windbreaks that receive water with the field crops they protect. Another 20,000 hectares of other wooded lands which are natural woody formations can be found either in the form of scattered trees with a crown density of less than 10% or as mangroves (FAO 2010). Northern Africa has begun to increase forest cover over the last decade, primarily through tree-planting projects, with Egypt having the highest average increase of afforestation, at. 3.3% per year between 1990 and 2005. However, the rate of annual increase declined somewhat during the period 2005–2010. The net area of wooded land remained constant over the same period (Mongabay 2009; FAO 2010). In terms of designated uses, almost 49% of forest area is classified as protected for purposes of soil and water conservation, 50% is classified as multiple use (multipurpose trees are planted for environmental protection such as high roads protection, sand-dune fixation, and protection of irrigation and drainage canals beside wood production at the end of the rotation), and the remaining 1% is for productive uses (FAO 2010). Although current forest policy in Egypt is enforced without an official law, Law No. 4 for the Protection of the Environment, amended in 2009, serves as the national legislation to formulate the general policy and prepare the necessary plans for the protection and promotion of the environment. Also, Law No. 102 of 1983 for Nature Protectorates forbids any actions, activities or undertakings which will lead to the destruction or deterioration of the natural environment, which may include protected forests (GOE 2010). Egypt is also a signatory on a variety of multilateral forest-related international conventions including the International Tropical Timber Agreement, 1994, Protocol Concerning Specially Protected Areas and the United Nations Convention to Combat Desertification in those Countries Experiencing Serious Drought and/or Desertification, Particularly in Africa (GOE 2010). Fifty percent of trees and plantation areas belong to private owners, and 50% belong to the government. In rural Egypt, farmers generally own the trees planted around their land, while the government owns the trees planted on the side-roads, highways, irrigation- and drainage-canals, natural gardens and local parks. Private land owners may cut down the trees on their land, provided they replant them (FAO 2010; Riad 2000). Private owners may include individuals, families, communities, private cooperatives, corporations and other business entities, private religious and educational institutions, pension or investment funds, NGOs, nature conservation associations and other private institutions. Forest management rights and responsibilities are transferred from the Public Administration to these entities through long-term leases or management agreements. All plantations owned by individuals are classified as protection forests, as their main purpose is the conservation of soil and water (FAO 2010). The Ministry of State for Environmental Affairs (MSEA) is the principal national environmental authority in Egypt and is charged with preparation of draft legislation and decrees pertinent to environmental management (including forest management), collection of data both nationally and internationally on the state of the environment, formulation of the national plan and its projects, preparation of environmental profiles for new and urban areas, and setting of standards to be used in planning for their development, preparation of periodical reports and studies on the state of the environment (GOE 2010). The Ministry of Agriculture and Land Reclamation has also been involved with afforestation projects (Riad 2000). The Ministry of Agriculture and Land Reclamation prioritized afforestation processes in the past and helped to establish development plans and agricultural legislation aimed at magnifying the forested areas through: (1) increasing the number of trees used as windbreaks, especially in the newly reclaimed areas, graduate youth- villages and new settlement sites; (2) using treated sewage-water in establishing forest plantations (man-made forests); (3) establishing afforestation nurseries throughout the country; (4) using new advanced techniques in irrigating and propagating timber trees; and (5) expanded plantings of tropical trees (khaya, teak, and neem) in Upper Egypt (Riad 2000). The Food and Agriculture Organization (FAO)’s Assistance to Forest Policy Formation, Legislation and Institutional Reorganization (2006–2008) was developed to: (1) increase the contribution of the forestry sector to the health of the environment and the country’s socioeconomic development; (2) put in place a comprehensive forest policy framework and forest legislation; and (3) strengthen the government’s capacity to lead and coordinate forestry activities and its linkages with other institutions, including governorates, local authorities and non-governmental organizations. No information or data relating to the outcomes of this initiative are available (FAO 2010). Egypt’s mineral and energy resources include petroleum, natural gas, phosphates, gold, tantalum and iron ore. The mineral industry, including petroleum and gas, factors significantly in Egypt’s economy, comprising 14.3% of Egypt’s GDP in fiscal year 2008–2009. Crude oil is found primarily in the Gulf of Suez and in the Western Desert. Natural gas is found mainly in the Nile Delta, off the Mediterranean shore, and in the Western Desert. Petroleum and petroleum products have been the leading mineral commodities produced and continue to be a vital segment of the economy. Egypt is also a significant producer of natural gas. Natural gas accounts for almost 50% of all hydrocarbon usage in Egypt. Goldmining is a rapidly growing industry with vast untapped gold reserves in the Eastern Desert (Newman 2008; Taib 2008). The Egyptian Civil Code establishes the basic tenure provisions for mineral rights, providing that ownership of land includes ownership of that which lies above and below the surface of the land, to the extent that it can be beneficially used by the owner. The Code also states, however, that public interest takes precedence over the owner’s rights in some cases, as the state may utilize the land below the surface for any purpose if such utilization is not detrimental to the property (Ziadeh 1978). Apart from the Civil Code, the laws that oversee the mining sector are the Mining and Petroleum Code Law No. 66 of 1953 and the Mining Code Laws No. 86 and No. 151 of 1956 (Newman 2008). In February 2010, The Ministry of Petroleum and Mineral Resources finalized the drafting of a new mineral wealth law, which regulates activities governing mines and quarries and exploration and economic use of minerals in Egypt. One highlight of the law include a transfer in the authority governing mines and quarries from the governorates (municipal authorities) to the Egyptian Mineral Resources Authority (EMRA). There will also be a periodical revision of the annual rent paid for the mine or quarry and payment of a 10% fee on the production of a mine or quarry, as will be determined by the executive regulations (Egypt Daily News 2010). Private landowners own subsurface rights to their land, subject to beneficial use and public-interest provisions, as noted above (Ziadeh 1978). Prospecting licenses are issued by ministerial decree for a maximum area of 16 square kilometers and for a period of one year renewable a maximum of four times. Mining leases are also issued by ministerial decree and are granted for up to 30 years, with one additional renewal option. Exploitation leases for quarries are issued for areas not to exceed 20 hectares for up to 30 years renewable once for a period of up to 15 years (Bermudez-Lugo 2002). Ownership of the mineral producing and processing facilities is a mix of government and private. Natural gas, petroleum, and petroleum products plants were the predominant producers controlled by the Government. The Government continues efforts to partially privatize mining and metal assets (Newman 2008). The Ministry of Petroleum and Mineral Resources is the Egyptian authority that supervises exploration, production, marketing and distribution of oil, gas and other natural resources. Five independent entities report to the Ministry, including: the EMRA; the Egyptian General Petroleum Corporation (EGPC); the Egyptian Natural Gas Holding Company (ENGHC); Ganoube El Wadi Holding Company (Ganope); and the Egyptian Petrochemical Holdings Company (Echem) (Taib 2008). Over the past few years, the Egyptian Mineral Resources Scientists Council, which reports to the Ministry of Petroleum and Mineral Resources, has created a long-term minerals-sector strategy for the country. The strategy prioritized developments in three areas: (1) the Abu Tartur phosphate rock reserves in the western desert; (2) the Al Wadi Al Gadid phosphate project in the southeast; and (3) petroleum exploration in the Sinai Peninsula (Taib 2008). The IFC worked with the Ministry of Petroleum and Mineral Resources on a mining sector policy reform project between 2007 and 2008. The purpose of the project was to increase private investment in minerals, and to rewrite the Mining and Petroleum Code Law No. 66 of 1953. The IFC considered the project successful in that it produced a draft law by 2008. In February of 2010, the Ministry of Petroleum and Mineral Resources finalized drafting of the new law (Taib 2008; Egypt Daily News 2010).